the license is non restrictive and can be included in comercial environments. The sample application can be run executing the file run.bat. This application will sign the file report.pdf using the test certificate in the certs subdirectory. This code will sign the report.pdf file using the test certificate in the certs subdirectory. There are other methods in the facade that let's you use a java Certificate object and/or streams. Look at the Javadoc subdirectory for a complete list of methods. You can add a digital signature to the PDF files you generate. This signature ensures the integrity of your document and its authentication. In other words, the receiver of the document knows you have created that document (authentication) and noone has modified it (integrity). The signature created will use the algorithms RSA signature, SHA1 hash and PKCS7 encoding. This section describes how to test the digital signature in the designer and view it in Acrobat reader. 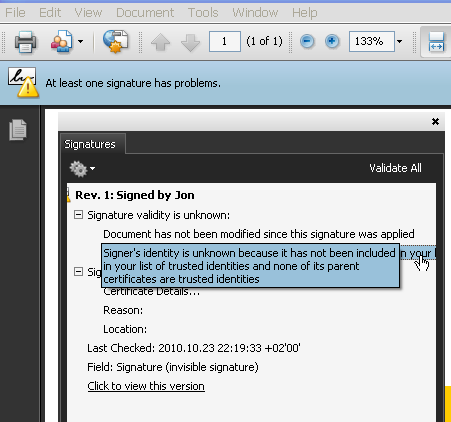 The PDF reader says the document has not been modified since the signature has been applied (integrity of the document). The signer's identity is unknown since the reader does not know our test CA. If you however click on the certificate details link and add the CA certificate as a trusted certificate, you will see the reader now accepts the signature. You can also make the signature visible somewhere in the page, for example on the left bottom corner. You use the PDFSignatureFacade class for making the signature visible. You can click on the text to see the signature information. This product uses the following libraries: Bouncy Castle library, the Apache PDBox library, the Apache Jempbox library and the Apache Fontbox library. The lib subdirectory of the delivery file contains all jar files together with the respective license and notice files.